Most Wor. Bro. Hodgdon appointed Rt. Wor. William E. Holland to serve as Deputy Grand Master. As a young man, Bro. Holland was active in Needham Chapter, Order of DeMolay, and has received the coveted Degree of Chevalier and the Legion of Honor. He was raised in Norfolk Lodge, Needham, where he served as Master. He is the Junior Warden of The Masters Lodge, Needham, and is an honorary member of St. John's Lodge No. 1, New York City. 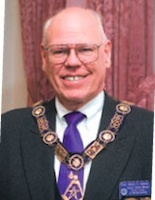 In Grand Lodge, the Deputy Grand Master was first appointed to serve as Grand Standard Bearer in 1993 and then District Deputy Grand Master of the Brighton 5th Masonic District in 1998–1999. He presently chairs the Grand Lodge 2006 One-Day Class Committee and the Electronic Communication Committee, and previously served on the Grand Lodge Long Range Planning and Public Relations Committees. Rt. Wor. Bro. Holland has been an active Scottish Rite Mason. Joining the Valley of Boston in 1984, he was appointed to serve as an Assistant Master of Ceremonies in 1991. He served as the Valley Family Life chairman and instituted the Charity Ball to support the 32° Masonic Learning Center for Children, chairing that event for several years. The Commander-in-Chief of Massachusetts Consistory in 2000–2003, he then served as Deputy’s Representative for the Valley of Boston in 2003–2005, President of the Scottish Rite Masonic Temple, Inc. and Trustee of Massachusetts Consistory. Bro. Holland received the Meritorious Service Award in 1993 and the 33° in 2001. Bro. Holland is a member of Mount Vernon Royal Arch Chapter, Needham, and St. Bernard Commandery, #12, Knights Templar, Boston. He is also a member of the Aleppo Shrine and Massachusetts College, S.R.I.C.F. (Rosicrucian). After working for Stone & Webster Engineering Corporation for nearly 30 years, Rt. Wor. Bro. Holland now serves as Executive Secretary and Director of Operations for the Supreme Council, 33°, Ancient Accepted Scottish Rite, N.M.J. He and his wife Amy reside in Needham. They have three children, Mary, Catherine and Andrew. It is certainly a pleasure to be standing before you as your Deputy Grand Master and I am truly honored by the opportunity to serve you and our Grand Lodge. Some of you may also be aware of one of my other roles as chairman of the Grand Master’s One-Day class. That obviously puts me in a position to discuss membership. How many times have we all heard that word lately? Unfortunately, in today’s world, we need to make sure that every Massachusetts Mason is cognizant of the need for membership simply to sustain our celebrated fraternity. As our ritual has taught us, the lapse of time, the ruthless hand of ignorance, and the devastations of war have laid waste and destroyed many valuable monuments of antiquity. The numbers tell us that membership in our great fraternity has seen a steady decline with the lapse of time. Time passes as our members age and no one takes appropriate action to replace them. Why? Because the ruthless hand of ignorance is demonstrated in the complacency of members who believe someone else will take care of the problem. Freemasonry, notwithstanding, may NOT survive if we don’t do something to change the downward spiral in membership. Membership is unquestionably the number one priority of this Grand Lodge and our Grand Master. He has set a goal to raise 18,000 new Master Masons in his term as Grand Master. 18,000! That’s almost a fifty percent increase in membership. By the way, he told me that after he asked me to chair the one-day class. Now, he is not looking just for 18,000 warm bodies. He is looking for 18,000 intelligent men of high moral character. I’m sure many of you are thinking, he’s nuts. It will never happen. How many of you thought that of the possibilities of the Red Sox winning a World Series in your lifetime or of the New England Patriots winning three out of the last four Super Bowl Championships. These goals did not happen because someone was ignoring the situation. They happened because of proper planning and teamwork. The Grand Master has a new membership committee to address the problems associated with membership and make appropriate plans for the future. Tonight, let’s consider the fact that everyone in this room is a member of the Grand Master’s membership committee, like it or not. You are here. You have obviously shown an interest in the fraternity or you most likely would not be here. So therefore, I would say that you are one of those team members we can count on to move the fraternity forward. Are you one of those members who think you did your duty several years ago and now feel that it is someone else’s turn? If so, I can point to that ruthless hand of ignorance again. In Scottish Rite, we would not consider you a worker, but a shirker. In the NFL, you would be a T.O. type of individual. You know who T.O. is? Terrell Owens of the Philadelphia Eagles, unquestionably the most self-centered player in the National Football League. Do you think for a minute that the New England Patriots could have won three Super Bowl Championships if the team were made up of a bunch of guys like T.O.? Of course not. They won because they were a well-educated, well-disciplined and well-coached TEAM. As a matter of fact, the Kraft family would not even consider making T.O. a member of their team. Why? Because he is simply not a team player. The patriots are a team, well educated, well disciplined and well coached. And that is what this audience needs to represent: a TEAM - a team ready to play for the benefit of the craft. I would say you are all probably fairly well educated. For the most part, you are probably fairly well disciplined, although some of us probably ate more than we should have. And, in our Grand Master, we have a great coach. that realizes the need for every player to stand up and play, to make a difference and to be an active participant in one of the oldest teams in the world. Certainly to sustain our fraternity, we need to look for new quality players every single year, just as the New England Patriots do. If we don’t, the team gets old and cannot be competitive in a league of many other well-educated, well-disciplined and well-coached organizations. Let’s consider what the New England Patriots' Scott Pioli and Bill Belichick look for in the draft. Pioli states, “Philosophically, the biggest thing that we look for in our picks, and when we make decisions, is finding the right guys for our system, finding the right guys for the head coach, and right guys that, personality-wise, makeup-wise, and, of course, skill-wise, fit into what Bill tries to do and the way Bill coaches.” This is all based upon his solid understanding of the game. How is what Pioli and Belichick consider in the NFL draft any different than what you or I would consider when thinking about someone becoming a Master Mason. We are obviously looking for the right guys for our system that will easily fit into our standards of high moral character. We each have a solid understanding of our game, we teach good work habits and we expect everyone to practice those habits every day. This is our profession. Like Belichick, our Coach demands the same of you that he would demand of himself and is asking you to make that extra commitment and to look around your circle of friends and see who that next draft pick is that YOU are going to identify. Our coach just happens to have termed his program, the "Pass-it-on” program. If you recall, Most Worshipful David Lovering reminded us that each one of us could make a difference. Well, think of the difference that Bill Belichick makes in the lives of his players every day. In today’s fast paced, supercharged world, people simply do not take the time to think about the difference they can make in the lives of others. Perhaps the “Pass-it-On” program has made you ponder about what you have done to extend the legacy of our forefathers in continuing to make good men better. But, have you taken the side of the ruthless hand of ignorance, or have you decided to make that extra commitment and really work as a member of this team? Hopefully more and more Massachusetts Masons will become a member of the team, act accordingly and make a difference. Now, as a member of this team, the first thing you need to do is learn the playbook. I will tell you right now, we have some work to do. In marketing Masonry, and yes, I mean marketing Masonry, you first need to know whom your audience is and against who you are playing? That is what every team in the NFL does in preparation for their next game. They analyze whom they are playing. In Masonry, we need to know what generation of individual we are talking to, because men will join the fraternity for very different reasons. Each generation has its own worldview, interests, and needs based upon the unique events and environment during their stages of life. institution builders, aggressive advocates of technological progress. They saw World War I, prohibition, the rise of the scouting movement, and a do-it-big and do-it-together attitude. Examples: Walter Cronkite, John F. Kennedy, Ronald Reagan. passive and aggressive masculinity. Leaders advocate fairness and were highly influenced by public opinion. Examples: William F. Buckley, Martin Luther King, Jr.
After that we have the BABY BOOMER GENERATION born between 1943 and 1960: an idealistic generation with leaders that are dominant and principled. No generation ever got more shots or had more operations. They are very much into ideas and causes including Woodstock, the sexual revolution and dual income households. Examples: many of us in this room, but also Oliver North, Bill Gates, Bill Clinton. ( Next, we have the GENERATION X, or the 13th generation, born between 1961 and 1981: a reactive generation with leaders who are cunning, hard to fool realists. Somewhat disillusioned they are the most aborted generation in history, looking for the higher quality of life. They are independent and defensive, comfortable with and seeking change. They practice the four “Ds” Divorce, Diversity, Daycare and Debt. Notable examples: Tom Cruise, Chelsea Clinton, Tiger Woods. Generation. However, their pulse runs fast as they are bombarded with frequent images and constant change where nothing will shock them. They process everything in narrative images. They are joiners, but their BS detectors are always on and they live for now. Examples: Tara Lipinski, the Olsen twins, the high school class of 2000 and the kindergarten class of 2000. While the GI Generation sought to embody “the brotherhood of man,” it also attempted to do great works by banding together as vast teams of people, working together for common causes. The need to fit in and conform eventually motivated much of the Silent Generation. Those historical patterns where people just naturally inquired and found their way into the fraternity were prevalent. They do not exist today. The Boomers, the 13th and the Millennial Generations are neither attracted nor motivated by these factors. What happened before, no longer happens. In the “old days” it was as if we played all our games on our own home field. Now there are no home games and no home field advantage. While at one time, the community, the family, the school, the church, the lodge, etc. all were supportive and interconnected within the social structure, that is certainly not the case today. They exist in a sort of casual association at best. Fraternal organizations stand by themselves as a unique and separate element within the community. They must define and promote their own identity and worth. The world has changed. People’s motivations and interests have changed and we need to realize that. Your Grand Master certainly has. He knows that if we do what we have always done, we WILL get what we have always gotten and that is simply not good enough. So, with that said, what attributes of Freemasonry are most attractive to the more current generational groups, say the three latest generations? The BOOMERS have settled down since the days of Woodstock, dropping out, and being groovy, and now seek personal development and growth. They are attracted to organizations that promote a moral center and defend worthwhile values. They are still seeking meaning in their individual lives. Freemasonry offers a whole system of moral and value-based meaning for life and living. We need to approach this generation with the idea of what Freemasonry offers to them as individuals and its strong support of meaningful values within a moral code. The 13th generation is often more solitary, sometimes disenfranchised individuals. You get their attention when you do something that is “real”. They are moved by actions, not words. They are looking for meaningful relationships. They are strong on community service and actions that bring pride, meaning, and fulfillment to their lives. They are unquestionably the toughest group to sell. We need to approach this generation by promoting opportunities for community service, charity, and benevolence by direct involvement and action. The MILLENNIAL generation, on the other hand, is seeking to be part of a team. They are looking for opportunities where they can achieve a meaningful corporate mission. Tell them they can make a difference in the world and in the lives of others as a part of this group and they should be quite naturally attracted to what Freemasonry has to offer, especially in the way of serving community needs. We now have an idea how to market Masonry to those who may be interested. You have a concept of generational needs, you learn the language and you are ready to communicate knowing who they are and who they hope to be. You consider what generation your potential candidate might represent and you proceed. This evening we started a new radio and television marketing campaign centered around Brother Benjamin Franklin’s goal of striving for greatness. Consider that your potential candidate may have heard Brother Ben encouraging him to consider his need to prepare for greatness. You possibly see some potential greatness in him. You ask if he would like to know more about Freemasonry. He responds affirmatively, and, as the Grand Master would tell you, you now have him in the door and it is now your job to make the sale. Your new friend completes an application, he is investigated and voted on and joins the fraternity. You have done your job and done it well. Are you done? Absolutely not! Chances are, if you leave him, we lose him! You now need to mentor him into your Lodge. Tell him you will pick him up for the next Lodge meeting. Take the opportunity to introduce him to other members of your Lodge. Sit with him on the sidelines, or if that is not possible, make sure someone else is prepared to. Answer his questions. After a few meetings, see if there is anything he might like to get more involved with, such as a Lodge sponsored event or committee. Your mentoring will make him feel 100% more comfortable in Lodge, and, most importantly, make him feel wanted. Think back for a moment and think about who in your life, specifically your Masonic life, passed it on and mentored you. Brother Ben reminds us that he needed to prepare for greatness. Someone helped him. Every single one of us in this room was, at a minimum, sponsored by someone. Someone saw a value in your becoming a Master Mason. Someone possibly saw potential greatness in you. Possibly someone was not just a sponsor, but also someone who nudged you along in your Masonic life. For me, it is a man who always considered the needs of others and still does: Right Worshipful Carl Gordon. His health has prevented him from physically being here today, but I know he is here in spirit. From my DeMolay days of making 4th of July floats in his store’s parking lot, to selling DeMolay Christmas trees, again in his parking lot, to his encouraging me to join the fraternity and be a Dad advisor, he has always been my mentor. He encouraged me to become an officer and subsequently Master of my lodge. He encouraged me to join the Valley of Boston and become an officer in Massachusetts Consistory, and certainly without question, he introduced me to many a great man in this room; he is the man that gave me direction in my Masonic life and has made it a most enjoyable one. He is a very special member of our family. The other individual was, of course, my Dad. He was a proud Mason, but he was a quiet Mason who lived a truly Masonic life, but he saw his role as supporting the Lodge on the sidelines, and, I suppose, watching me. Both Carl and my Dad taught me great things in life that I will never forget, mostly, to do things right. With my Dad, it was always “there is a right tool to do the job right the first time.” Subsequently, I now have tools that I often have to figure out what they were originally purchased to accomplish. With Carl, in Masonry, it was if the cipher says the word is “this”, then it is not “that”. I’m sure that each of you has a similar story. The many, many, friends that you would not have met unless someone, some individual who saw greatness in you, silently nudged you along to provide the basis to make you a better man. The key thing to remember here is that they did not drop you like a hot potato. They were your Masonic mentor. Over time, they worked with you and in time, they helped make you a better Mason and subsequently a better man. So, I ask you, whom are you going to help make great? Whom are you going to nudge along into greatness? Look at your circle of friends, relatives and associates and determine what generation they represent, what you need to do to encourage them to be with us and what you need to do to nudge them along into greatness. This page was last modified on 3 February 2016, at 10:36.